The East-German economist Eva Müller (1928-2011) has proven, that she has a special gift for teaching1. Just for that reason her latest book Marxsche Reproduktionstheorie deserves a review. On top of that Müller is an interesting personality. Just like the first Eva ever she is afflicted with curiosity2. And after the revolution of 1989/90 in the German Democratic Republic, she was one of the few leading excecutives and intellectuals, that have refused to become evanescent and retire. The revolution which fortunately did not lead to violence, remains a strange phenomenon. Within a year many of the sciences lost their ideological basis. That certainly holds for the economic science, which during forty years had been rooted in the marxist-Leninist doctrine. While it is true that this dogma has some merits, it has been glorified in a preposterous manner. One would expect, that after Die Wende a significant part of the East-German economists would continue to go their usual way. People become attached to ideas, that have been appropriated with effort. However this did not happen. The revolution has wiped out in a single blow the dogma and everything that was attached to it. It just evaporated. The natural platform had disappeared, and apparently the bearers of the ideology lacked the energy to fight for a new platform. They preferred the evasion in stead of the discussion. Apparently their arguments were not really evangelical. It turned out to be girl talk3. Those who are interested in the old doctrine and its line of thought, are forced to roam the booksellers on East-German flea markets and the second-hand bookshops. At a great age (77 years) Eva Müller has filled the publication void by writing an introduction about the marxist macro-economics. In itself the contents closely resembles the older books, that can be found on flea markets. The content is in an even vein, because Eva Müller did keep her ideas - contrary to many others. Fortunately, thanks to her personality she has managed to remain safeguarded against the nasty Leninist habit to petrify the text into dogmatic phrases, often repeated without end. Also her book does not annoy the reader with all kinds of obligatory references to the various party- and state-organs. And most importantly: this book has been written with an absolute intellectual freedom. Müller did not have to fear the censors any more, who prior to its publication judge the contents on its propagandist merits. It is just us, girls. In a way Müller does not succeed in shaking off the past. In the book she continues to refer to Karl H. Marx himself. One could translate the German word Marxsche by marxist, but apparently in Müller's eyes it really means by Marx. During three quarters of a century the East-European scientists had the chance to develop the labour theory of value (LTV). But if one consults the text-books, including the book of Müller, then one finds little more than the knowledge of Lenin and Marx themselves, neatly arranged. This suggests, that in all those decades hardly any progress has been made. That is not just shocking, it is mainly sad. The handfull of marxist scientists in the west has accomplished more. Your reviewer had hoped that Müller would furnish insights yet unknown to the west. Alas, in this respect the reader is disappointed. But evidently the ideas of Marx deserve a careful evaluation. And in accordance with the reputation of Eva Müller the book is written in a clear style. She manages to explain the economy in common language. Even readers with little prior knowledge will probably be able to grasp her arguments. For this the LTV is indeed quite suited thanks to her emotional appeal. The material, that is presented by Müller under the name Reproduktionstheorie, could eventually alsp be called national economics. She proves that she is well informed. In her foot-notes she refers to modern text-books, and she applies her knowledge to the present-day Germany. Müller deals with the national economics in the spirit of a circular flow. The reproduction is a continuous repetition of the sequence production - distribution and circulation - consumption. Each phase in this sequence gets its own chapter. The book concentrates on the distribution, in connection with the role of money. The gross national product of Germany is analysed by means of recent statistical data. Müller points several times to the relation between the marxism and the modern theory. For instance, she equates the concept use value directly to the theory of marginal utility. In this respect she differs in a positive way from the Leninist doctrine, that is hostile to the work of Gossen. Of interest is also the manner in which she explains the differences in labour productivity within Germany by means of the income distribution. West-Germany (notably Hamburg, Hessen, Bavaria) monopolizes the commercial and financial services, the domain of the exorbitant (not merited) incomes, and East-Germany is unable to match this. In the final chapter Müller discusses the input-output table of the German economy, which she calls the intertwined matrix. This is the theme, where she is truly an expert. It is strange, and somewhat disappointing for your reviewer, that she devotes almost the entire chapter to the production schemes of Marx, and even to one not very instructive scheme of Lenin. Possibly melancholy has prevailed here over her scientific nature. The explanation of the real intertwined matrix gets just seven pages, which is too frugal. This is especially regrettable, since she is so well-informed on this subject. Is this a deliberate evasion? An invitation to the reader? In the epilogue she summarizes her discontent about the dominating current theory. The discontent focuses on two annoyances. First, in the modern theory the factor labour does not get the prominent place, that it deserves. On the contrary, it is treated on an equal footing with other production factors (capital, land). That ignores the productive character of the human labour. Second, and not unexpectedly, Müller claims for the intertwined matrices a more leading place in the economic science. Only in the intertwined balances the national economy becomes truly transparent. The argument of Müller is certainly worth considering. Indeed the product prices turn out to be more correlated with the expended labour than is commonly assumed4. And notably the national economy can only be understood, when the relations between all branches are known. Evviva the total social product! Therefore it is understandable, that Müller sees Marx as the founder of the economy. With some right she states that he has introduced the input-output tables. For the total product of the national economy is his invention, just like the model of the industrial exchange (the famous marxist departments). The Russian economist Leontief, who is generally called the intellectual father of the intertwining model, was deeply involved in the Leninist planning methods. Thus he takes the same line as Marx. The reader should not expect to find in Marxsche Reproduktionstheorie an explanation of the relation between labour values and prices. Müller is not interested in the problem of the value modification as a consequence of the general average profit rate. Neither does the book describe all those ostentious economic laws, that prided the Leninist states5. Also she renounces the rethoric about monopoly prices. It is the merit of Müller to set the marxist economy on his legs, and to apply her mainly to those fields, where she has proven to be useful. It is curious how Müller stresses that the GDR has failed. She even states that the economy of the GDR was shrinking in her last years (p.19). On 0.57 she calls the market-economy more flexible than the plan-economy. Somewhat shocking is her conclusion on p.68, that apparently a policy of planning by means of material balances can not be successful6. And on p.79 she argues that in the end the East-German planning (where she herself was a prominent official) invested a too small part of the final product7. And finally on p.146 she writes that an economy with central planning is not sufficiently flexible in situations that require a restructuring8. Müller sat close to the fire. Yet her criticism and self-criticism seem to be heavy on hand. One could reply to the criticism of Eva Müller with: eventus stultorum magister (Livius), or: she is wise after the event. Namely, the GDR was undoubtedly a prosperous state. in judging her criticism at least the eventuality should be considered, that it may be evoked by a sense of guilt. The GDR elite, of which she was a part, maintained the Leninist dictatorship. The justification of such a paternalism could only be an unprecedented improvement of the material conditions of living. To put it differently, eventus docebit (the results count). And the dictatorship failed to realize just this improvement. Indeed it was not that beneficial. 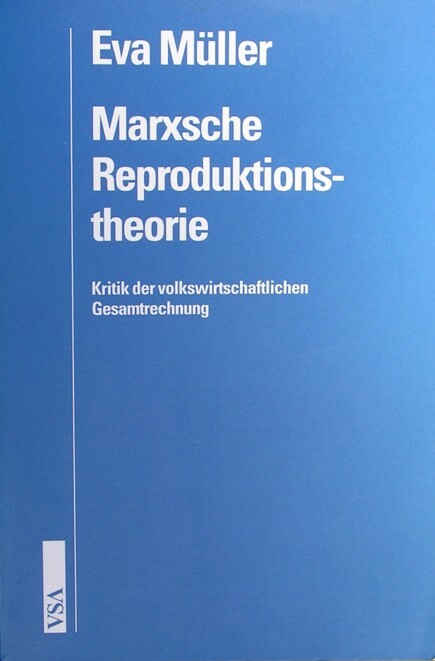 The publication of the book Marxsche Reproduktionstheorie was not a direct hit. The absence of a platform was undoubtedly unfavourable. For leftwing radicals the book is too factual. And for economists working in a market economy the intertwined balances (input-output tables) are just not very attractive. Even the states with a central plan bearly managed to efficiently guide the national economy. In a market economy the intervention is at most possible in a handful of branches. Even so, it is fortunate that at last Eva Müller has documented her deep insights, knowledge and experience, and now in a "modern" and "free" manner. In its field Marxsche Reproduktionstheorie is now already a classic work. All beautiful girls end up in heaven.